We converted an old house into a space with a room for all budgets. Simple dorms (one with aircon) & clean bathrooms at one end of the spectrum and large ensuite doubles with aircon, or private terraces, at the other. The house is located in a busy corner of downtown Mendoza. Central plaza and bus station just 10 minutes walking. Public buses to all the wine regions leave from opposite the front door. There are all kinds of grocery shops, places to eat, cafes, bars and much more close by. Our reception will be happy to help you book tours, restaurnats, or anything else and help you avoid paying too much for a trip that you can do yourself on a public bus, or a hike you can easily do on your own. Just have a chat to us. Please make sure you contact us with your arrival time so we can make your arrival easy. You can arrive/enter any time with the door codes but we tend to operate flexi hour reception to be here when needed. After 3 months traveling around South America we finally found a hostel were we felt just like at home. The garden and the common rooms are amazing, an awesome place to chill. If you come to Mendoza stay at this hostel! 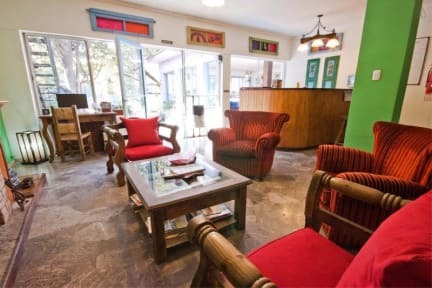 Perfection may not be something from this world, but Lao Hostel in Mendoza goes truly close to it! Central position, cozy, clean, particular and tidy environment, friendly and smiling staff making you feel home, nice and pretty rich breakfast, well equipped kitchen with an amazing oven, silent and relaxing garden... Did I mention the price? Just the best in town and in most part of South America. We had an amazing assado for a very good price with Mike and Celeste, the owners. Thank you, guys! Nice hostel with good atmosphere. The garden is a plus and the owner is a very nice guy. 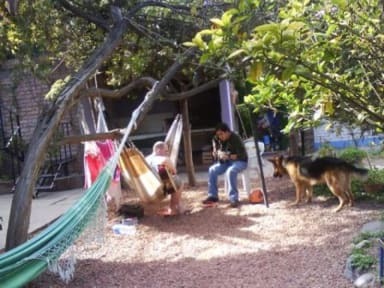 Close to the bus station, it's a bit far away from the city centre (15-20 mins walking) but a good choice if you're staying in Mendoza for just a few days.